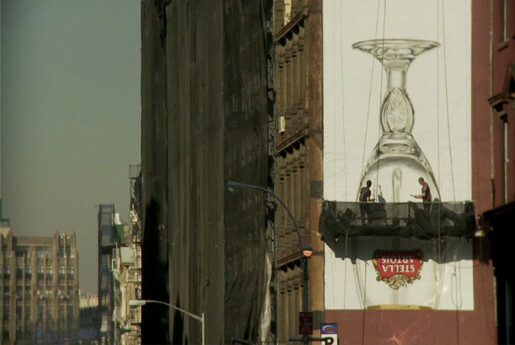 Stella Artois “Ritual Project“, a time lapse photographic study exploring the pouring of beer in New York, has been edited together into “Up There”, a short documentary online at uptherefilm.com. Painters from the team reflect on their art, an alternative to the current practice of placing pre-printed vinyl billboards. The documentary is 12:46 minutes, and may take some time to load. The “Up There” “Ritual Project” campaign was developed at Mother New York by Alex Stankiewicz, executive creative directors Linus Karlsson and Paul Malmstrom, creatives Christine Gignac and Jon Lancaric, agency producers Mike Aaron and Emma Starzacher. Filming was shot by director/editor Mekanism, San Francisco/New York, with 1st Assistant Camera Christopher Parker, executive producers Mat Lundberg and Tommy Means, line producers Katie Matson and Tommy Means. Painters were Colossal Media/Sky High Murals, Bob Middleton. Sound was mixed by Peter Buccellato at Sound Lounge. Music by The Album Leaf, courtesy of Sub Pop Records, was supervised by Jason Baker at Singing Serpent. Timelapse photography was by Morgan Howland.